Weight training is a rewarding form of exercise, and the Centers for Disease Control and Prevention recommends that adults add two sessions of weight training to other aerobic exercises every week. However, weight training can also have unwanted effects, including pain, injury, back strain and inadvertent added muscle bulk. Still, strategies that you can utilize during your workout will add lean, tight muscle with a more even appearance to help reduce your muscle girth while improving your strength and overall health. The number of repetitions you perform is key to building the type of muscles you desire. Many research articles focus on gaining strength, and generally these articles show that exercising to the point of total muscle failure, or the physical inability to perform one more correct repetition, yields the best strength gains. Because this type of exercise results in significant muscle bulking, however, you should adopt an alternate form of weight training to achieve lean muscle. Instead of lifting heavy weights for four to 10 repetitions and resting in between, lift lighter weights more quickly and for many more repetitions, such as 40 or 50 reps with little or no rest. General Physical Preparedness, or GPP, is a exercise strategy that focuses on strengthening and improving the physical performance of your entire body with every workout and is an effective approach for building lean, tight muscle. Taking a GPP approach, you should exercise every muscle group daily. However, you should take care to focus on one muscle movement group at a time for targeted strength training and use aerobic exercise to challenge the other muscle groups. Determine how many days of weight training you want to do per week. Divide your muscle movement groups and assign an even number of muscles per workout. For example, if you plan to do weight training two days per week, focus on the arm "push" and "pull" one day and the leg and abdominals another day. Complement your weight training with opposing aerobics to allow for more mild exercise as your muscles recover for one week from weight training. For example, if you have exercised your legs, then jump on the elliptical for your aerobic session and use your arms on the arm poles to ease the burden on your legs and target your arm muscles. While weight training is an effective tool for building lean muscle, aerobic exercise also builds lean muscle and should be a part of any exercise workout plan. Another weight training plan that can add long, lean muscle quickly involves performing the same exercise for a specific time, such as two to five minutes. Because of the excessive time of the repeated exercise with no rest, you will have to select a significantly lower weight, perhaps around 25 percent of your max lift or less, to allow you to maintain form over the extended time. However, this approach forces your body to recruit more muscle fibers than with lower repetitions and will allow you to target the entire length of the muscle rather than just near the center, which leads to muscle bulking. 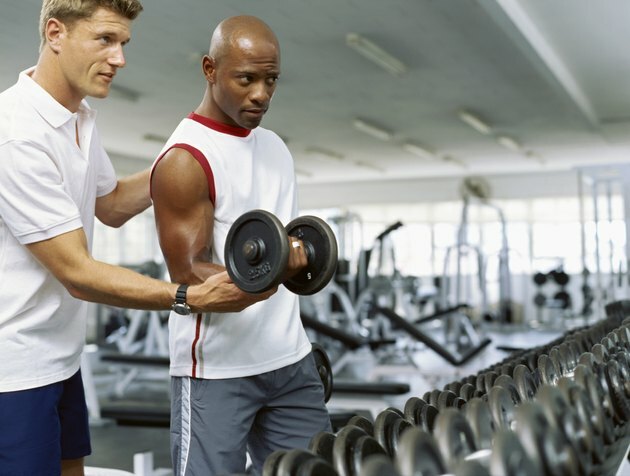 Many weight training exercises do not target the entire length of the muscle. For example, when you perform triceps presses lying down, you hone in on the center of the triceps muscle, but you don't reach all the upper triceps fibers, which can help to reduce upper arm flab. Consider adding a multi-joint complex exercise to target the entire muscle, creating a lean appearance. When doing the triceps press, for example, once you have lowered the weight down by your ear, bend at your shoulder joint to bring your upper arm back toward the ground to add shoulder flexion. Keep moving until the weight is near the back of your head, then return to the standard triceps press position and resume the press.